One of the best ways to stay independent is making the home safe from falls. American senior citizens want to stay independent and living in their own homes for as long as possible; many dread the thought of moving to a nursing home or assisted care facility. Yet each year almost 250,000 people fall and injure themselves so severely that they require medical attention and many of these are seniors. As we age, the recovery time from an injury is much slower, so it is better to prevent an injury before it happens. It is important to remember that anyone can fall and injure themselves  young or old  so these tips are for all households. One of the best ways to stay independent is making the home safe from falls. Since 60% of falls happen in the home it is the first place to consider making modifications. Look at the lighting throughout the home and change fixtures or bulbs to make each area as bright as possible. Pay close attention to stairwells, doorways and hallways which are often not well lit. Extra light in the kitchen also makes food preparation safer. Remove obvious tripping hazards like clutter and loose area rugs. Be sure carpets are securely attached especially at the edges. Loose areas of a carpet should be taped or nailed down. If carpet has developed wrinkles over time, it can be stretched and nailed at the wall to hold it tight, this can be done by a carpet installer or a handy do-it-yourself person. Installing grab bars is an easy way to make any home safer. 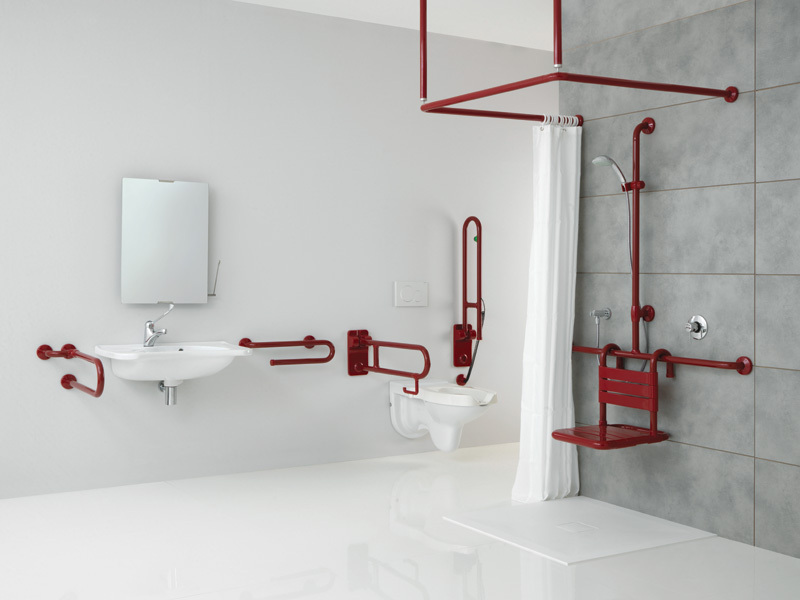 The bathroom of every home should have grab bars added for the prevention of falls. If the toilet is next to a wall that is the perfect location to add a grab bar. A bar on the wall in front of (across from) the toilet helps people get up and down. Even above the tank is a good location for adding a grab bar; if the bar is hung high enough this one can double as a towel bar  but be sure it is a properly installed grab bar in case it needs to be used as a grab bar. Towel bars are not designed to support an adults weight and could cause significant injury if used as a grab bar. The shower and bathtub are a very dangerous place for slips and falls because they are so often wet and can even have soap or shampoo residue that makes the area extra slick. Grab bars should be installed at the entry to a shower or tub to assist with both entering and exiting. Inside the shower or tub grab bars offer support for anyone with balance issues or who needs a bit of help getting in or out with wet feet. There are straight grab bars that can be installed vertically and will double as a hold for a hand shower head. Grab bars can be installed on an angle or horizontally to help someone maneuver in the shower and tub and can even surround the entire bathing area for added security. Always mount the grab bar into a wall stud for a secure and safe installation. Portable or permanently mounted shower seats and benches can be added to the shower or bathtub of those that have difficulty standing during bathing. Using a portable version is helpful for those recovering from a surgery or other injury when they expect to return to their former mobility after they recover. Portable seats are also helpful for if someone needs to occasionally sit while at the sink  this one piece of equipment can serve in two areas. Grab bars are often thought to be a bathroom product but they can also be used throughout the home to make it safer. Installing a grab bar vertically by outside doorways will help everyone enter the house more safely. If a railing is loose or missing on stairs to a basement or at the entry to the home, adding a grab bar will insure a safe passage. 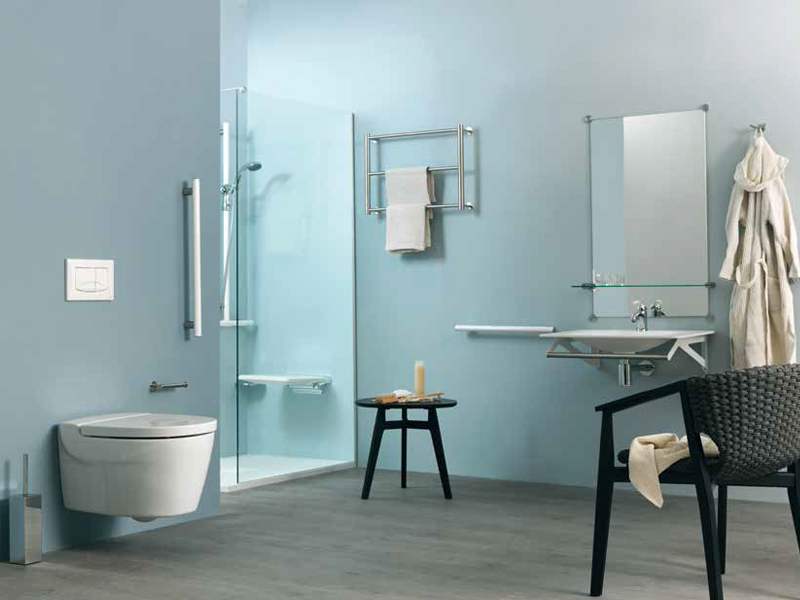 Transition areas and any threshold moving from one area to another is a spot to consider adding a grab bar. A folding grab bar can be installed if it is only needed occasionally, for example during the winter season, which will save on space. Grab bars should always be securely mounted to wall studs; this will prevent the grab bar from being pulled from the wall in the event of a fall. Usually installed 33 to 36 from the floor, grab bars can be installed based on the height of the user. A petite woman at 5 feet tall may need her grab bars at a lower height than a man who stands over 6 feet tall. Grab bars are versatile and can be mounted vertically, horizontally or at any angle. Always select high quality grab bars with 1.5 mm stainless steel thickness, so the grab bar will hold up and last. A comfortable grab bar diameter is 1 ¼ inch. Grab bars are available in a number of colors and finishes  stainless steel in both polished and brushed (satin) as well as white grab bars are usually the most popular however other options are also available.